Your favourite dragon from How to Train Your Dragon? Dreamworks production "How to Train Your Dragon" is the latest visual stunner to hit the screens. It is definitely a favourite in our household, especially after watching the sequel on the big screen. Have you seen the movie? Do you know the names of all the dragons? Which dragon is your favourite? If you had the option, which one would you want as a pet and why? Courtesy of teo avid fans in the house, I know the names of almost all the dragons in the movie and also the name of their species. My favourite is Toothless, who is a Night Fury. I like him because he is intelligent, loyal, brave and speedy. I've seen the film once, but I wasn't particularly interested in it. I don't have a favourite dragon. 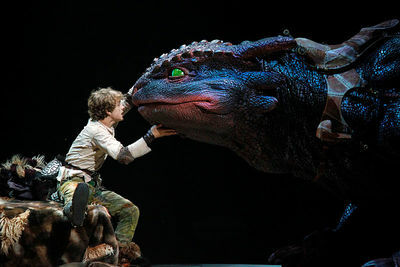 I haven't seen How To Train Your Dragon yet but it is certainly on my must-see list! Minions Movie out in 2015. Are you excited? Which review aggregator do you read for online movie reviews? What did you think of the movie 'Gone Girl'? Been on the City Circle Tram in Melbourne? Movie with an unexpected ending? Do you fill your recycling bin to the brim?